I love the feeling of having the fire going, candles lit, and enjoying an intimate meal around a cozy table with delicious food and amazing company. 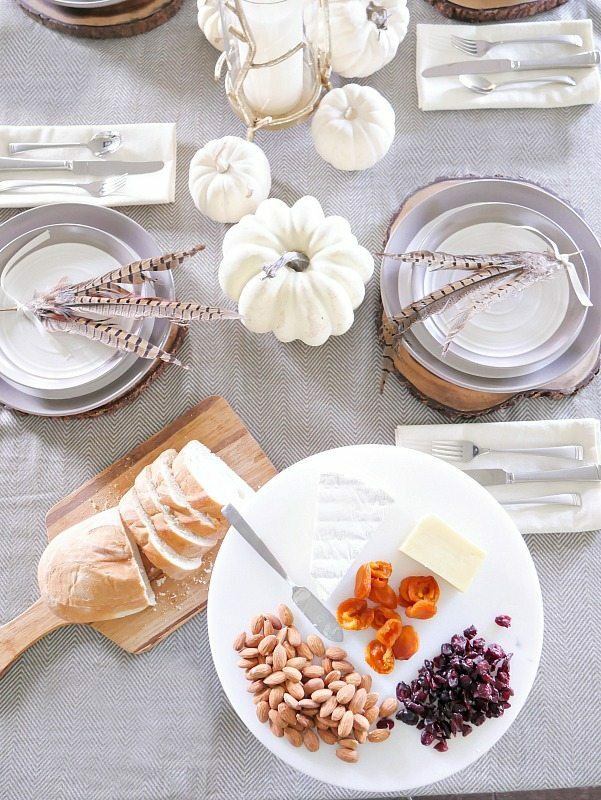 This month Better Homes and Gardens challenged us to create a glamorous yet affordable Fall Table Setting using products from their line at Walmart! 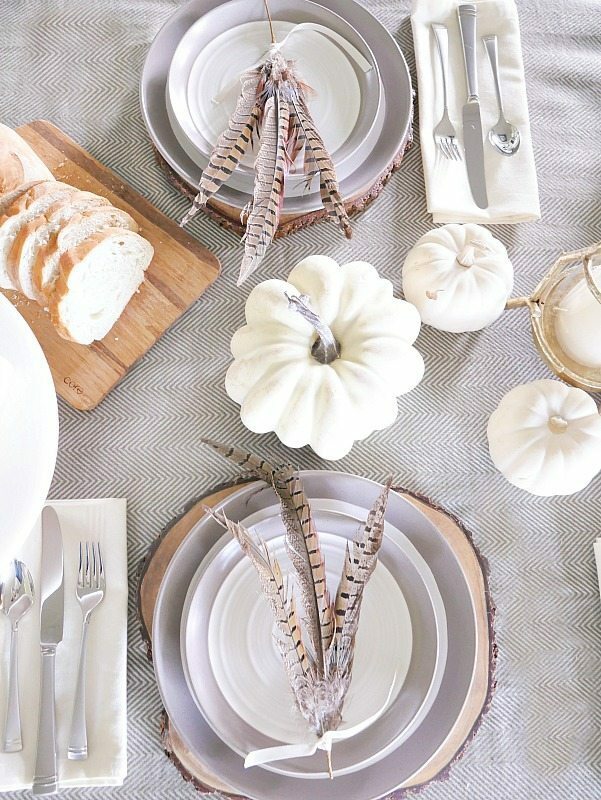 Today, I’m showing you my Simply Elegant Fall Table Setting. Yes! Can you believe 95% of what you see on this table is from Walmart? Let’s take a closer look. I could not believe all of the beautiful pieces that are part of the Better Homes and Gardens line for this fall. 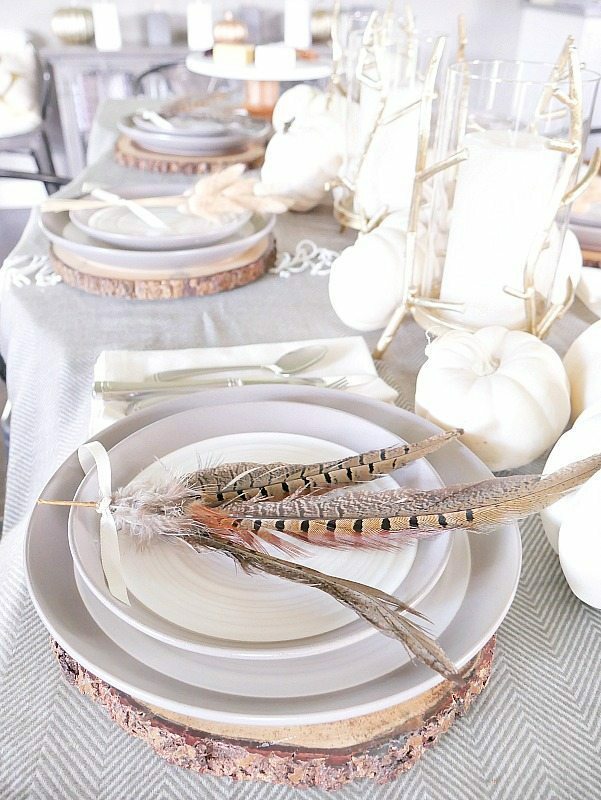 I went with a really soft look for the table, using a mixture of gray and white with natural accents like wood, feathers and wheat. 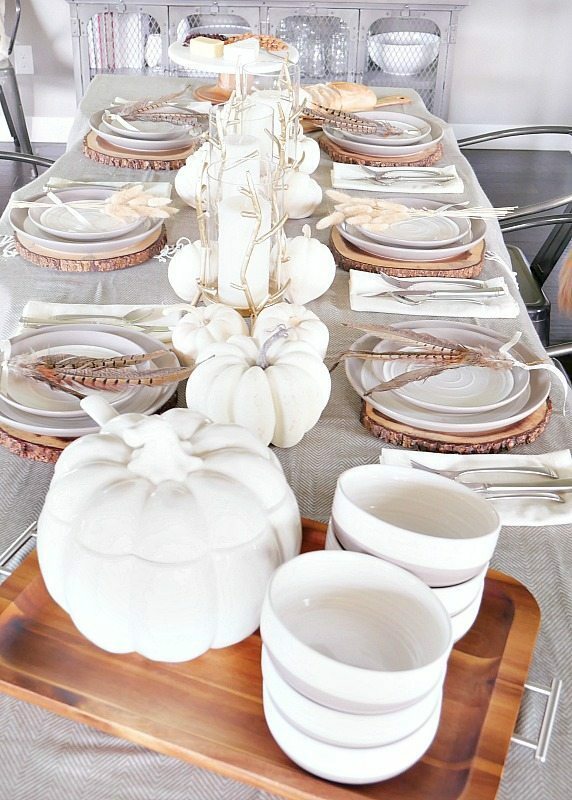 This pumpkin tureen is so fun for the holidays, it can work with both Halloween or Thanksgiving or even used as a centerpiece like I did last year! 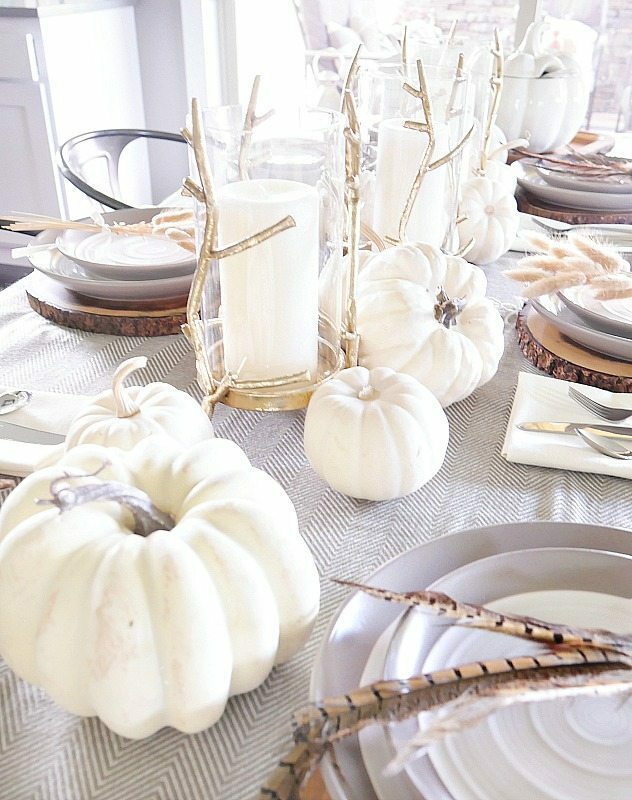 I went with a very simplistic centerpiece using the Gold Twig Candles and white pumpkins. I love tall centerpieces but when you are having a dinner party they just aren’t that practical when you are trying to have a conversation! 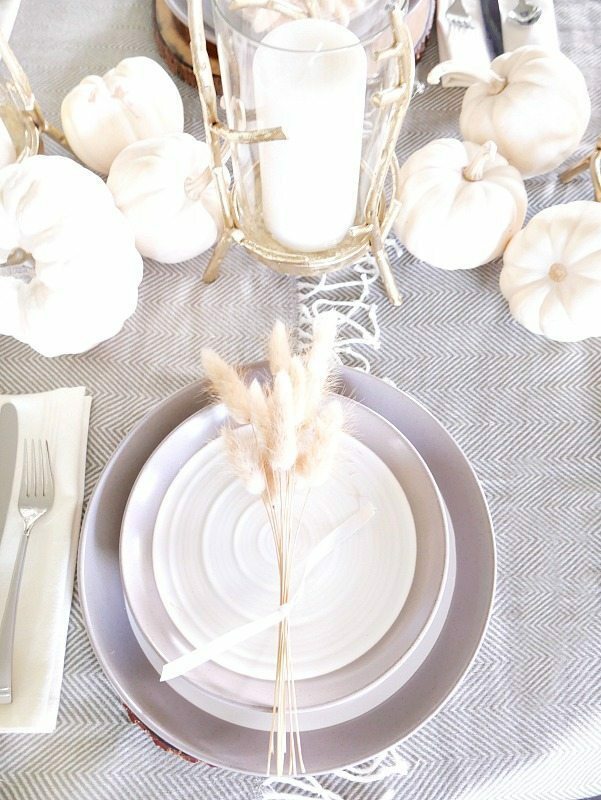 I used a mixture of both bunches of willows and pheasant features to add a little texture to the place settings. Something so simple but can really tie a look together. These Wood Chargers are just stunning. I wish they were a tad larger so you could see them under the plate better, but they are so cool. 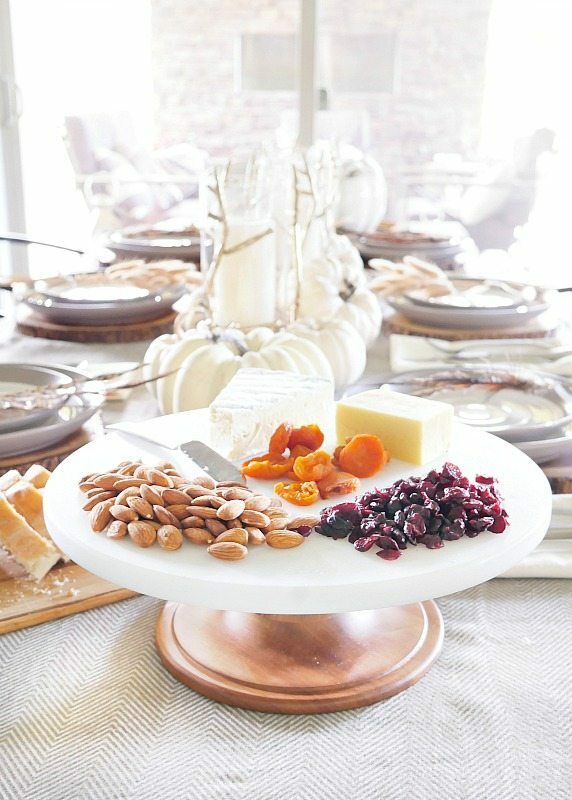 I’m a huge fan of cheese and nut platters. 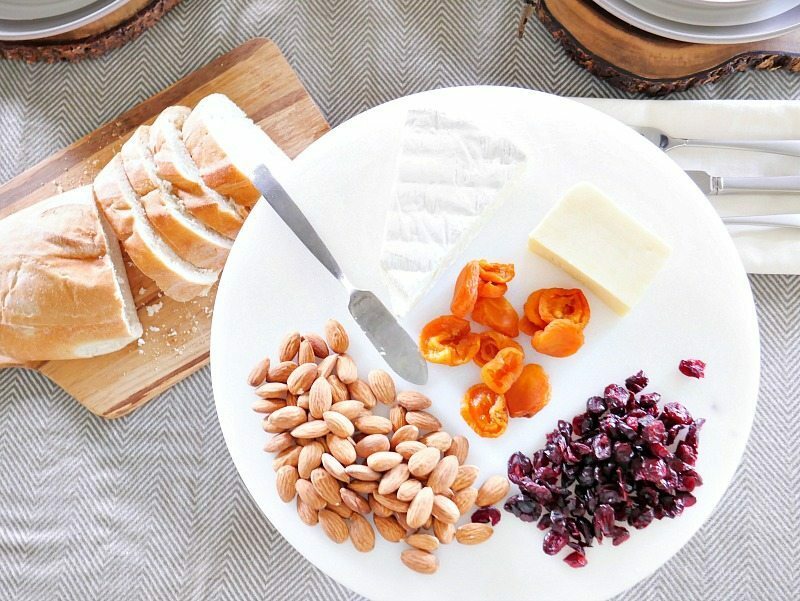 I love the combination and it’s always a great dish to set out as an appetizer for guests. I love using this beautiful Marble Cake Stand to display it on. Texture is a huge part of what I do. I love working with different textures in all my spaces. 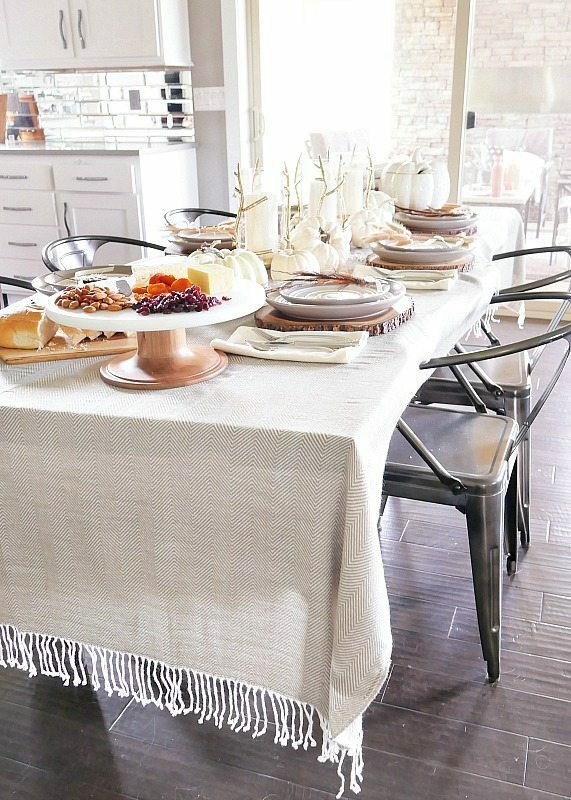 I typically don’t use table cloths because I love the natural look of our live edge table, but I thought I’d mix things up and try using this Gray Herringbone Throw Blanket as a tablecloth. It instantly made the look feel very fall and cozy. 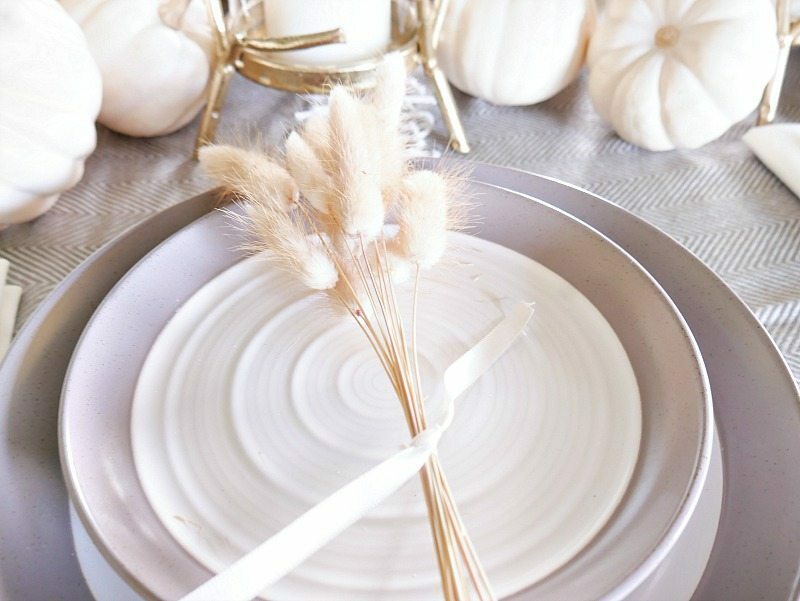 If you are looking for fun new items to add to your fall tablescape, these are all very budget friendly options! This is simply stunning Taryn! Love it all! Gorgeous!! 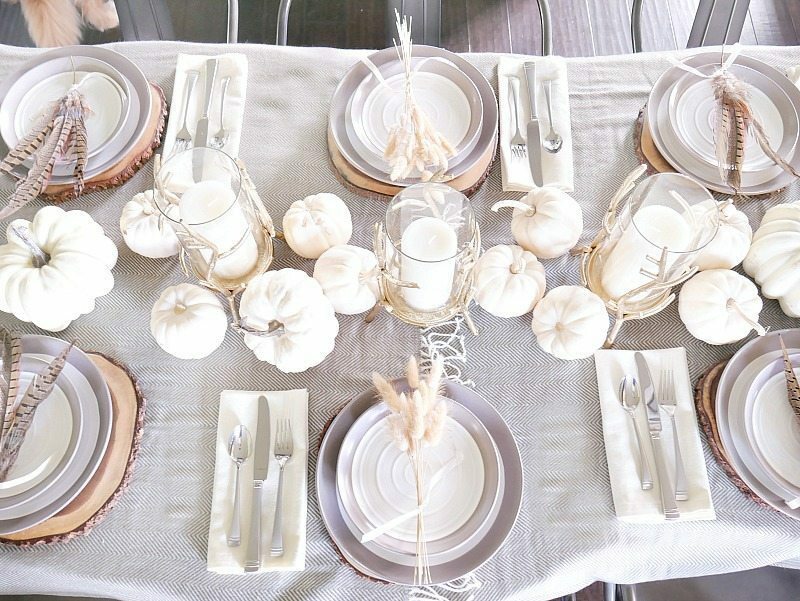 Love those gold twig candle holders!! 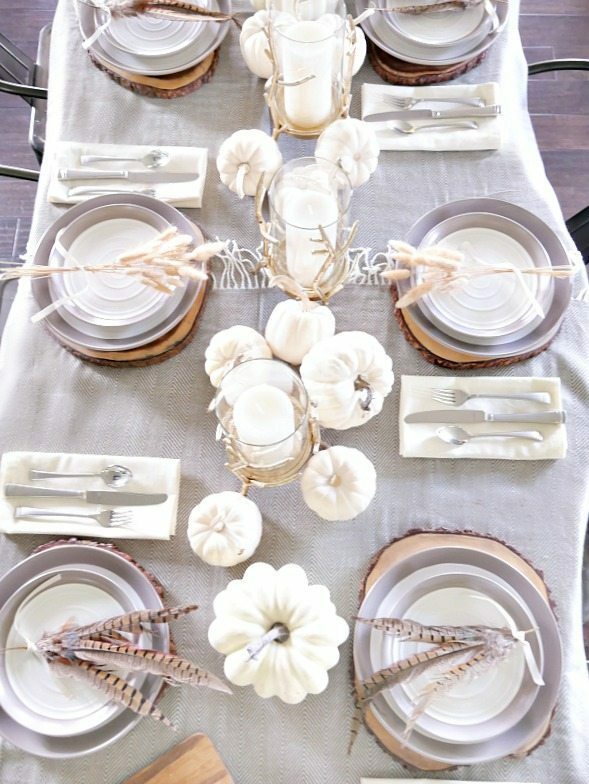 I love those candle holders. I may need to buy a few for my dining table, too. Beautiful all around!